For the purposes of this blog project, I read the Bible cold. This restricted me to what was said in its pages. This allowed me to avoid people imposing their own interpretation of what is said. However, I quickly learned (or perhaps realized) is that the English Bible, among other things, is a translation, meaning that God (regardless of your belief system) did not pass on this information in English; therefore, you can’t read the text in English and avoid interpretation. So, once I finished the Old and New Testament (or Hebrew and Christian Testament, depending on your point of view), I sought out other texts to enrich my understanding of what I’d read. In order to get a wider picture of the era in which the Bible was written, I read works associated with but ultimately excluded from the Bible: The Apocrypha. I also read a series of books that shed light on how I should (or could) understand these ancient works, such as a scholarly examination of who wrote the four Gospels in the New Testament. Other books have helped me better understand the real reason behind this blog project: what the Bible really has to say about homosexuality. 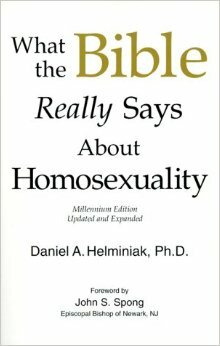 Of these books, Daniel Helminiak’s What The Bible Really Says about Homosexuality has been the most helpful. This author, a scholar (and professor) of theology and spirituality, digs deep into specific sections of the Bible that have traditionally been used to support anti-gay reads of the Bible. His work in these pages comes with a useful endorsement: an Episcopal Bishop, John S. Spong wrote the foreward. If a leader in the Christian Church endorses what he has to say, that lends weight to what this book has to say about the Bible. As I outlined the information I wanted to discuss in my posts about this book, I realized that a lot of what I was hoping to learn in this project is summed up well in these pages. I also realized that I needed to read a lot of background before engaging with this information. My project thus far, basically, has prepared me well. I found myself gathering my ideas and covering ground already discovered in previous posts on this blog—although much of what I have previously discussed merely scratched the surface, beneath which Helminiak digs deep. He also does such a thorough job, there doesn’t feel like there’s much more to say on this topic. Therefore, I made an important choice: This series of posts will serve as a stopping point for this nearly-three-year-long project. Over the course of these nine (or so) posts, I will discuss what he has to say and also wind down all I have learned. I have learned much about the Bible and developed an appreciation for what it contains. I also feel better equipped to engage in a conversation about its message. I also hope that what I’ve learned has proved useful to my readers and, if anything, some of this content has made an impact, however small, in the ongoing discussion about how the Bible is misused to justify an anti-homosexual agenda. I’ll begin this series with Helminiak’s approach: understanding the different ways to approach the Bible. This entry was posted in Helminiak's What The Bible Really Says About Homosexuality and tagged Bible and homosexuality, Brad Windhauser, Helminiak's What The Bible Really Says About Homosexuality. Bookmark the permalink.